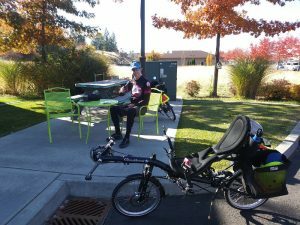 Today we took our fourth “coffeeneuring” ride (see the post on our first ride for more information). We tried to go to a donut shop, but arrived about 10 minutes after it closed (didn’t check the hours, doh!). 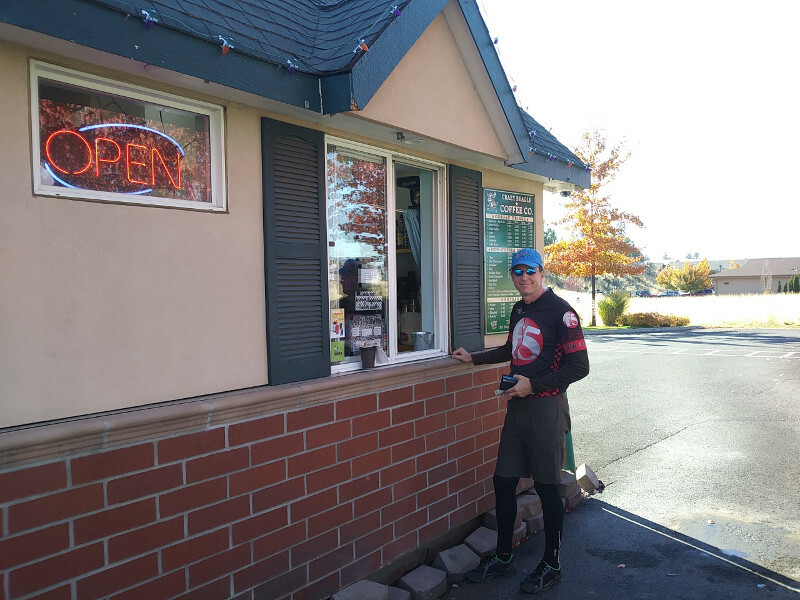 So, we circled around to a few doors down from where we went on our third ride (yesterday), and went to the Crazy Beagle Espresso, 22026 E Country Vista Drive, in Liberty Lake, Washington. It’s a drive-through espresso shop located in the parking lot of a veterinary clinic. Most of the coffee places near us are, like this one, of the drive-through variety, but this one also has a handy outside table. The ride was slightly under 11 miles total. The weather was beautiful, low 50s and breezy. We both enjoyed hot chocolate; I had a raspberry oat bar and Zach had a chocolate-chip cookie. After the cocoa, we also stopped into the clinic across the street and got our flu shots before riding home.